Every good behind-the-scenes Hollywood story needs three things: a charismatic star, a visionary director, and a journalist to write tirelessly about them both. The Coen Brothers have officially found all three for their next film, Hail, Caesar! 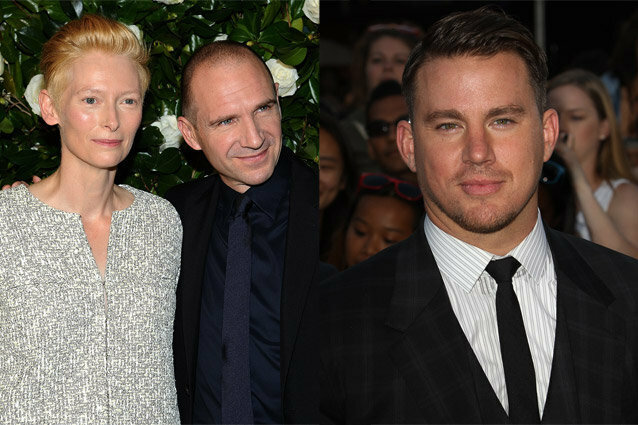 in Channing Tatum, Ralph Fiennes and Tilda Swinton (via THR). The three join George Clooney and Josh Brolin in the film, which has been described as a comedic look at the career of Eddie Mannix, who worked as a fixer in the studio system in the 1950s. It’s not every day that we come across casting news more exciting than high-profile engagements and major roles in Marvel blockbusters, but the Coen Brothers have managed to do just that with their latest additions. Forget Thanos; he won’t be nearly as interesting or menacing as Swinton’s gossip columnist. To prove how everything else pales in comparison to this casting news, we’ve ranked the cast members of Hail, Caesar! in order of how excited we are to see them on the big screen. Who He’s Playing: Brolin’s role hasn’t been revealed yet. How Excited We Are: Meh. Brolin’s become a Coen Brothers fixture as of late, and we’ve enjoyed him in all of those films, but he’s not really known for his comedic ability, which makes us a bit wary about this part. Who He’s Playing: Eddie Mannix, the studio system fixer who helped keep scandals out of the press and made problems disappear, sometimes through less than legal means. How Excited We Are: We’re interested. It’s been a while since Clooney did any comedy, but Eddie Mannix seems like a perfect role for his natural charm. Besides, everyone knows that Clooney’s collaborations with the Coens are his best films. Who He’s Playing: Laurence Lorenz, a studio director. How Excited We Are: Quite. Think M. Gustave with a bottle of L’Air de Panache. The Grand Budapest Hotel reminded us just how delightfully funny Fiennes can be, and Lorenz seems like it will provide plenty of opportunity for him to channel that kind of whimsy once again. Who He’s Playing: A “Gene Kelly-type” star. How Excited We Are: Pumped. Tatum’s three major skills are comedy, dancing and being charming, and a major Hollywood player is the perfect opportunity for him to showcase all three. Plus, being cast in a Coen Brothers’ movie opens him up to a completely different caliber of film, which means we could soon be in the midst of a Tatumissance. Who She’s Playing: A powerful Hollywood gossip columnist. How Excited We Are: We’ve already bought out tickets. We’d watch Swinton in anything, but a terrifying yet glamorous gossip columnist with the power to make or break careers is the kind of role that Swinton will turn into a tour de force.